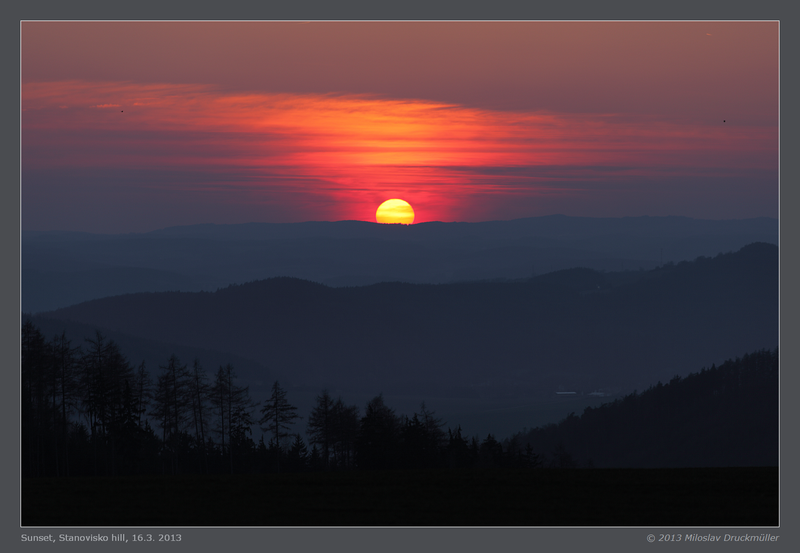 After a period of bad weather, April 16 was the first day with clear sky and the first opportunity to see the comet PanSTARRS near Brno. 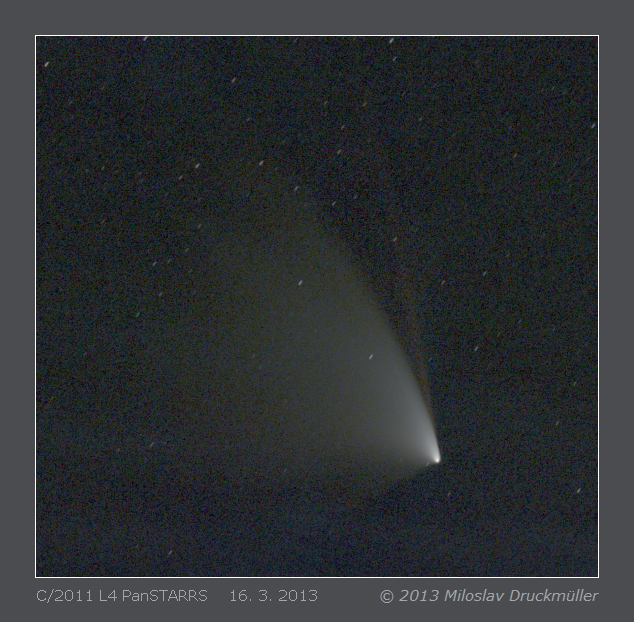 Even though the comet was very bright we were not able to find the comet neither with naked-eyes nor with binoculars. However it was easy to find the comet on the camera display. 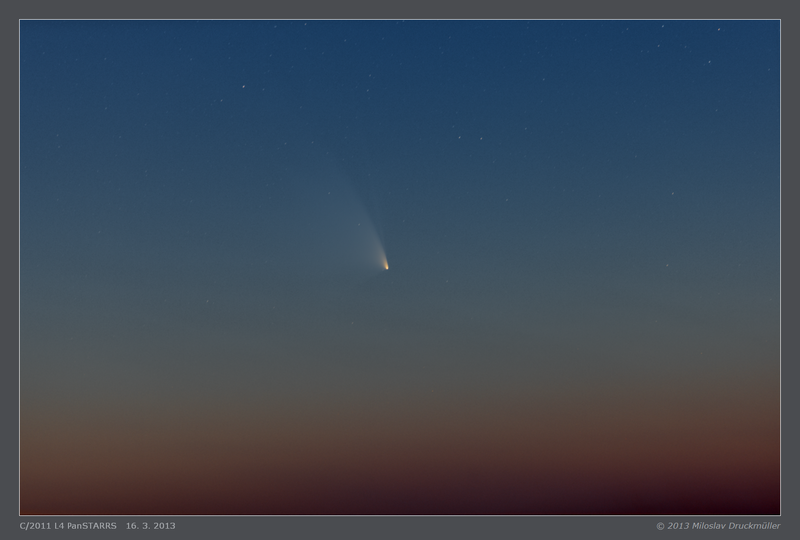 The image in this page shows the PanSTARRS comet about 75 minutes after the sunset just before the comet immersed into the layer of thin clouds near the horizon. This very short time interval was the optimal one on that day. However the comet was near the horizon and the sky was still not dark enough. Very precise image processing was necessary to separate the extremely low contrast comet's tails from the background. The dust tail forms a fan of several steams covering the angle of about 90° (from 8 o'clock to 11 o'clock orientation). I considered the narrow strait ray in approx. 11.5 o'clock orientation to be a ion tail. Then, during the image processing, I realized that it is not the correct idea. This tail was visible in the red and green image component but was not visible in the blue one which surprised me. Another suspicious fact was that this tail is perfectly straight without any structure caused by the magnetic field. After seeing the comet spectra on the Internet, it was without any doubt that it is the sodium tail. The yellow-orange color of this tail is clearly visible in the image which has completely subtracted sky background. The image presented on this page has rather low resolution, because it was necessary to achieve acceptable both comet contrast and S/N ratio. 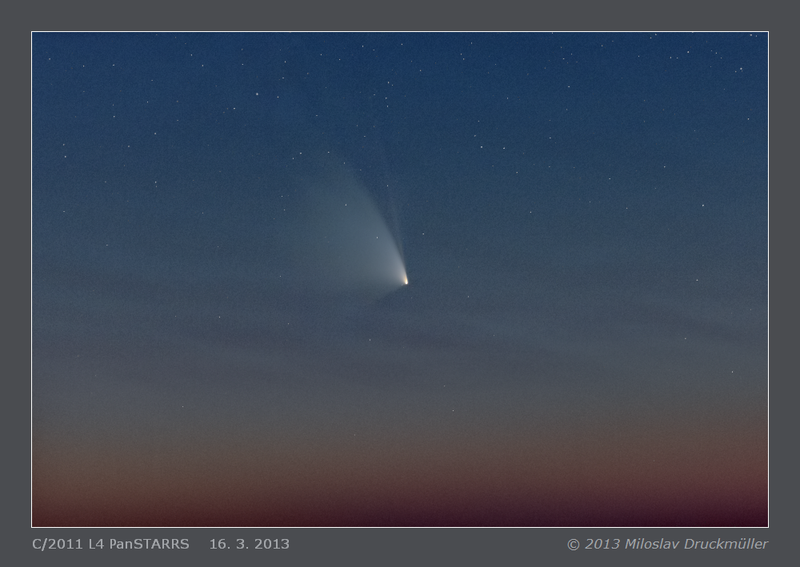 That is why I made another image where the comet has lower contrast.